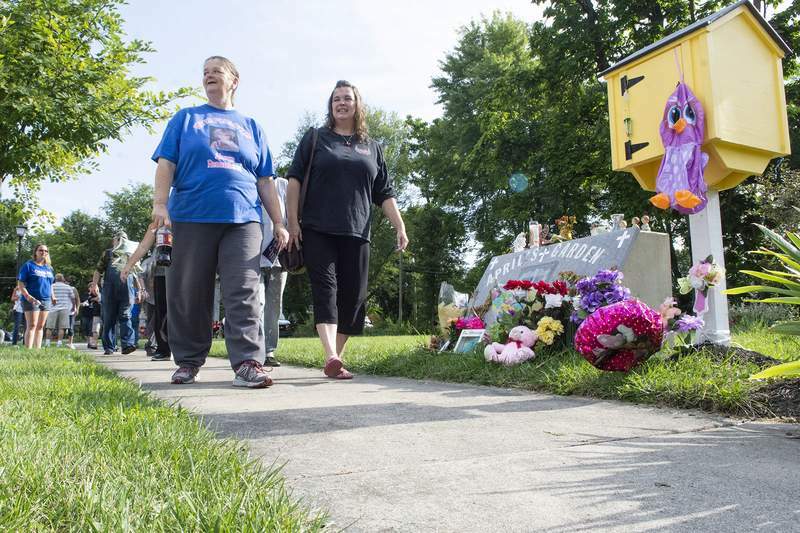 Brett Luke | The Journal Gazette Janet Tinsley, left, leads the memorial walk for her daughter April Tinsley past April's Garden on Saturday afternoon weeks after police made an arrest in the 30-year-old case. Brett Luke | The Journal Gazette Geffory Crowell of the Salvation Army leads attendees of April’s memorial walk in prayer prior to the event at her garden on Hoagland and Masterson Saturday afternoon. 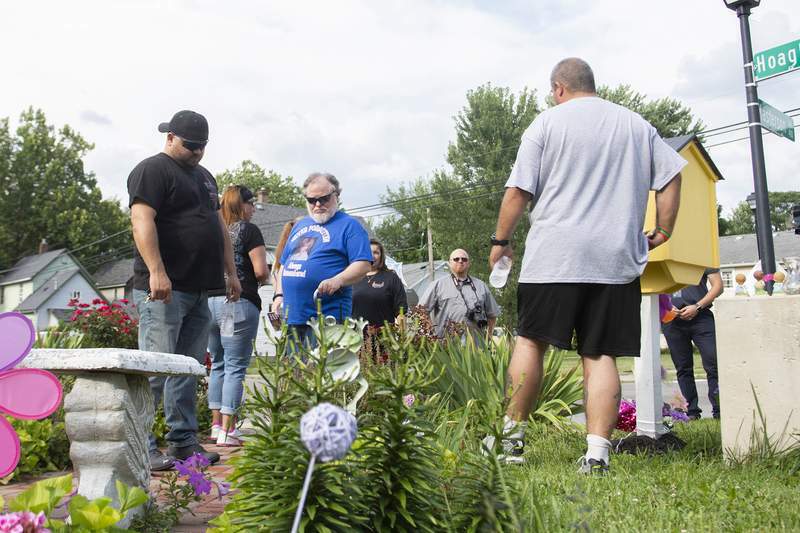 Brett Luke | The Journal Gazette Community members come out to pay respects to April Tinsley in her garden prior to the memorial walk Saturday afternoon. When Janet Tinsley sits down on the stone bench in the garden created in memory of her daughter, April, a white butterfly almost always comes to visit. The butterfly visits so often that Tinsley and others call it the “angel butterfly” and like to think it could even be the 8-year-old girl who disappeared on Good Friday in April 1988, and was found dead in a ditch in DeKalb County three days later. She had been sexually assaulted and strangled. On Saturday, neighbors, friends and family gathered at the garden at Masterson and Hoagland avenues in Fort Wayne, but this time it was to express their gratitude for the arrest and to show continued support for the family that has endured so much pain and uncertainty for 30 years. Two weeks ago, John D. Miller, 59, of Grabill was arrested and charged with April's murder. He is being held at the Allen County Jail without bond and has pleaded not guilty. He has a court hearing Friday. Lemons said he didn't know the family personally, but arranged for the Fort Wayne branch of the Salvation Army to come with its van. 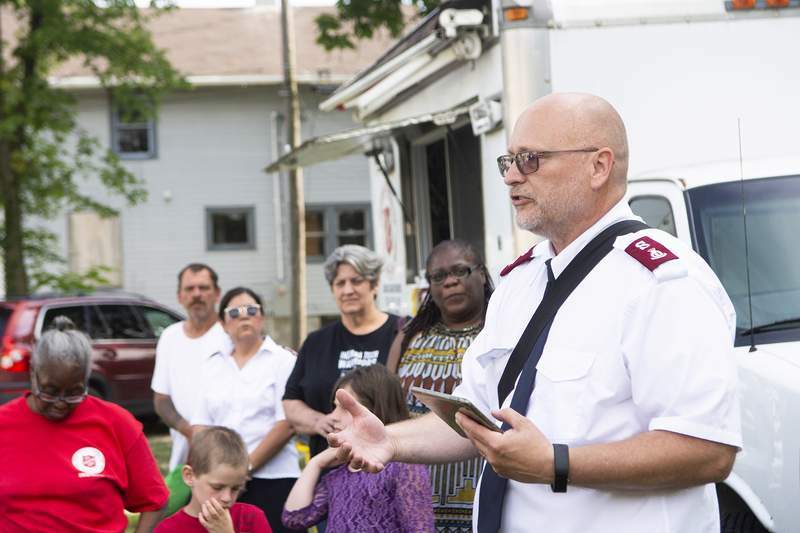 The Salvation Army put out tables and served hot dogs and beverages while about 30 people walked between the small garden at the corner of the lot lent by a local family and the shade of the Salvation Army stand. Maj. Geffory Crowell and his wife, Maj. Leti Crowell, both with the Salvation Army, addressed the crowd and Janet Tinsley, who smiled patiently and answered questions. “I'm just trying to wrap my head around it,” said Tinsley, who came with other immediate family members who did not wish to be identified. The identity of her daughter's killer hasn't sunk in yet, she added. Besides neighbors who never seemed to waver in their support of the family, Tinsley has attracted new local activists who brought her to the walk. Stacey Davis, an executive with #FlipThisCity and Katelyn Gustin with #Justice4MurderedChildren accompanied Tinsley to the garden and brought her favorite beverage, a Dr Pepper. Tinsley and Davis led the walk that started from the corner garden and back again. Sightings of the white butterfly that fluttered around at the beginning of the gathering led some to hope it would stop by again, but the crowds might have scared it off. Tommy Goings, who tends the garden, said a butterfly first came when the shovels went into the ground in 2015 and has been there ever since, even though the life cycle of the insect is 10 months.